You had a job to do – you did it well. We were all as proud as you when you came home sporting your medals on your chest. I had a job to do – I did it well. I never received any medals, but I could handle screw-drivers and wrenches with the best of them. No stranger to Fringe, Linda’s most recent play Four in the Crib was an audience favourite at the 2012 Edmonton Fringe Festival, and again in June 2013 for Alberta Seniors Week. Her first play Spring Alibi (2005 Edmonton Fringe, directed by David Cheoros) garnered a Sterling Award nomination for Best New Fringe Work and was remounted in 2006 (Capital Fringe, Washington DC) and 2007 (Nakai Comedy Arts Festival, Whitehorse YT). Spring Alibi was also named Best Play at the TheatreONE Festival in Saskatchewan (2012). Linda wrote Support Ho’s as a tribute to her girlfriends, for the 2009 Fringe. I had the opportunity to see True Grid, her homage to football fans, which sold out at the 2007 Edmonton Fringe and was remounted in 2010 as an official Grey Cup event. It was funny, insightful, intelligent and entertaining… a lot like Linda herself, who I’ve had the pleasure of getting to know over the past few years. 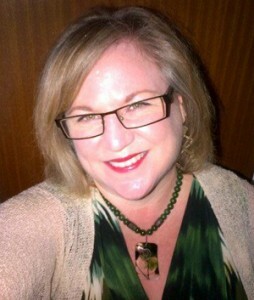 When not writing or going to CFL games, Linda is a governance/bylaw specialist for non-profits and a funeral celebrant. Linda graciously gave up some time from her busy pre-Fringe schedule to chat about her new play and her experiences as a playwright. What was the first play you saw that inspired you or made you want to write? The first amateur play I saw was Walterdale Theatre’s annual Klondike Melodrama. It is funny and silly, complete with a dastardly villain and a damsel in distress. It occurred to me that the actors were regular people like me. The first professional play I remember seeing was “The Odd Couple” at the old Citadel Theatre in Edmonton. Both of these experiences made me interested in drama. Plus, my brothers and I used to create skits and commercials to put on for our parents. The thought of writing for the stage didn’t occur to me until 1997 when I was on sabbatical in the Yukon. There was a sign advertising a 24-hour playwriting contest. It cost $35 to register and you got a hotel room and couple of meals. I had 35 bucks and I really wanted a bath, so I signed up. In between baths and meals I wrote a play – Bic pen on loose leaf. When the time was up I thought about setting it on fire, but the organizers wrestled it out of my hands. About six weeks later the theatre company tracked me down and gave me a cheque because it had won a prize. I was astonished, but it was incentive enough to keep working on it. I eventually joined Alberta Playwrights’ Network and got some help, met some people, etc. That play was Spring Alibi and it was a hit. I haven’t turned back. 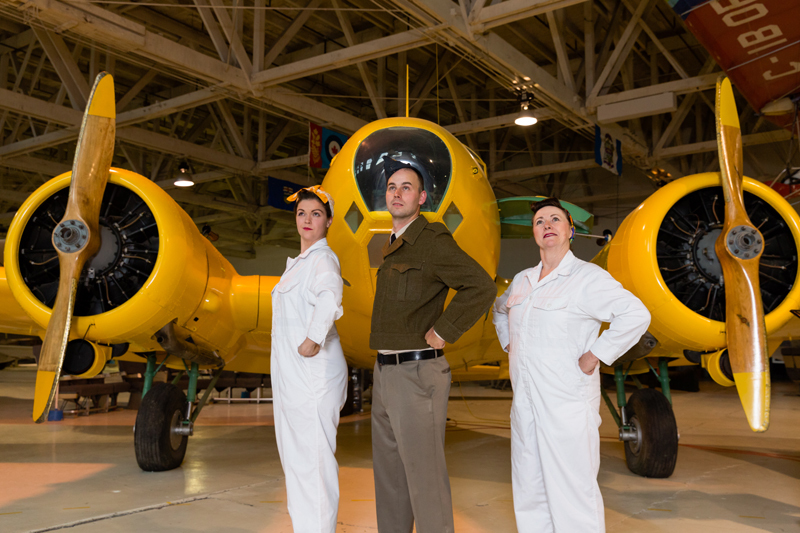 Your new play is based on your mother’s experiences as a wartime mechanic. Did you grow up hearing these stories, or did you learn new things about your mom in creating this play? My mom always claimed that her job in WWII was the best job she ever had. I heard many stories, but it wasn’t until I started to write this play that we both realized how many stories she had buried. The impact of her first real love, the many and horrible deaths she saw, the overwhelming responsibility of doing her job without errors while still hanging onto the traits that make us human, and the disappointment of having big dreams and then having them not work out. These didn’t come up before this show. 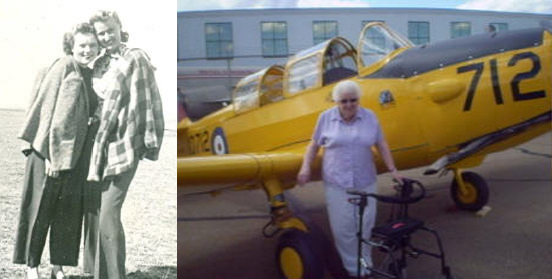 Ethel (in plaid jacket) with a friend during her airplane mechanic days – left, and today – right. What do you hope audiences will think about or take away from watching this play? I hope they leave having been entertained and that they gain an appreciation for the types of people who helped pave the way for what we enjoy now. I’m talking about women in non-traditional roles, I’m talking about pride in Canada, I’m talking about realizing the difference a regular person can make. I’d also like them to have a desire to see more live theatre. How often do you draw on your experiences or those of people you know when writing? So often! In fact, I’m probably doing it now! I take real scenarios, and certainly real pieces of dialogue, and put them into fictional situations. Never Let the Crew See You Cry is the most historically accurate show I’ve done. My other plays are full of truth, but the characters are usually not real, or are composites. Sometimes I’ll overhear a strange conversation and know I’ll need to use that somewhere. None of my plays are about me directly, but True Grid and Support Ho’s come very close to things I’ve lived. When you start writing a new play, what do you begin with – a character, a scenario, a setting…? Until this show, I always started with dialogue. I literally get the voices in my head saying exactly what I’m to write down. Of course, this changes from draft to draft, but it’s usually the words. The setting is next for me, and eventually I move onto the character. The dramatic arcs are second last and the ending is dead last. I have the worst time with endings and oddly enough that was even true with this historical work where I know exactly how it ends! What do you love about Edmonton’s Fringe Festival? It’s exciting – big and noisy and full of interesting people and largely located in one geographic area. I also love that Fringe festivals in general are relatively low risk (in terms of cost and time) so it’s easy to “try on” all kinds of theatre experiences – many are even free. Anyone can be a critic and the beer tents are the best places to find out what’s hot. As proud as I am of Edmonton’s Fringe, I am delighted that other cities are starting up their own. It’s good for everyone to have that kind of theatre opportunity and any festival where 100% of the box office goes to the artists is just fine with me. What are the challenges of Fringe? It’s an un-juried lottery system so there is always the chance that your name won’t be drawn. If you’re not drawn and decide to produce on your own, it definitely costs you more money. Fringe is perfect for one-act plays of about an hour in length, but it is a difficult place to produce a full length play. And if you can’t do it at Fringe there are very few other places to try it out. The other challenge is that because the rule of thumb is to divide your box office among the actors, director, playwright, etc. in equal shares (after expenses) it’s a crap shoot whether you’ll have anything at the end or not. I happen to be a rare breed – a business person who happens to be an artist. With my business head, my people usually do better than most for having given up an entire summer. We can thank our audiences for that. The other challenge with divvying up the pot is that as a playwright I tend to limit the number of actors I use just so it’s worthwhile for all. Your plays have been performed across North America. How often do you get to see the productions in other cities? In True Grid you included some of the superstitions football fans have. Do you have any superstitions when it comes to the world of theatre? I don’t think I am as superstitious as the actors. The people who actually tread the boards are full of anxiety and good luck/bad luck things. I try to respect those but I don’t really own them. Most never want to know what the reviews are like either, but as the producer I need that in case I use some of it to further promote the show. For my first few plays that I stage managed, I vomited before every performance. Thankfully I got over that in 2012 (after approximately 33 times bending over the waste basket). Everyone was happy that I cleared that hurdle. I will say that there is a thing called a “Weird Second Show” which is accurate in my experience. The second show is never “bad” but it’s somehow always bizarre as a result of the audience, the actors, or both. I’d like to get back to a short play I wrote called Society of the Oddly Disappeared which is a comedy about a secret society of “dead” celebrities who may not actually be dead. I did a staged reading in 2011 and it was well received, and now I’d love to see it as a one-act play. I also co-wrote a full-length production which is a farce and very timely and topical. I’d love to see that get into the Mayfield Dinner Theatre or some place like that. I also am considering a one-woman show about my perilous adventure on the Chilkoot Trail. As dramatic and terrifying as that hike was for me, I think the audiences would find it hilarious. I have no doubt that they will. Thanks, Linda! Never Let the Crew See You Cry begins August 16. For dates and more information visit Linda’s web site. Promotional photos by Edward Allen. All images courtesy of Linda Wood Edwards, used with permission. ← How Tin Can Knits can help you learn to knit… free!